bassist Shorty Valentine, and drummer Gabe Wilson. 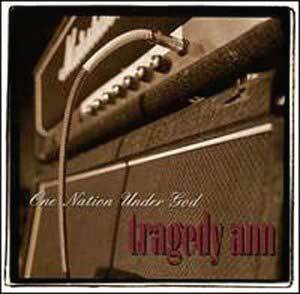 Tragedy Ann is a Christian rock band whose members include Mikee Bridges (lead vocals), John Bronco (guitar), Shorty Valentine (bass), and Gabe Wilson (drums). The group, which includes two members from the former band Sometime Sunday, has released three albums: Lesser, One Nation Under God, and their latest, Viva La Revolution. Their influences include Foo Fighters, Cracker, Social Distortion, The Altar Boys, ACDC, and the Smithereens. The members of Tragedy Ann may be rockers, but they are first and formost, followers of Jesus Christ, and that is ultimately what drives them to do what they do. Their desire is to reach people for Jesus and share their joy in Christ with them. Forget the money and the special perks, these guys are in it to win people over for the Lord. "We'll sleep in the dirt if it means we can minister the Gospel to kids in a way that they can understand," says lead singer Mikee Bridges. The group isn't in the business for the money or fame, but to spread the gospel to kids in a way they will understand. While the members of Tragedy Ann reject the notion of rock star status, they also recognize the platform they have been given. It is a gift they do not take lightly. And it is a dichotomy they address in their song,"Eugene."